Closed-panel inspections eliminate inherently highrisk tasks, such as removing panels or opening hinged doors. The resulting work task is safer for personnel, plant assets and processes. How does your facility inspect equipment that can no longer be opened while energized due to that equipment’s voltage or incident energy rating? How does your facility inspect equipment protected by switched interlocks? Inspection windows provide safe access to “inaccessible” energized equipment. The XDV is built to out-live your enclosure. You have to see it to believe it. Our window body and cover are machined from half-inch bar stock aluminum. All other components are stainless steel. 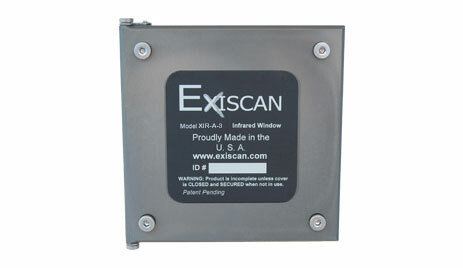 When it comes to durability and brute strength, ExiscanTM is without peers.